There is nothing worse than preparing a beautiful wedding ceremony only to have guests unable to hear what is being said! Open outdoor spaces, beaches and places with a lot of background noise can quickly drown out speech and music. If you have a large number of guests, and/or are planning to have your ceremony outdoors I would always recommend the use of a sound system for amplification. To hire the sound system costs from $150 and while it is an extra cost, it is a worthwhile investment for making sure the ceremony is heard and that it all runs smoothly. We have deliberately kept the cost of this low as we don’t want the cost to be a barrier to couples having the best wedding experience. While the single speaker works well with groups up to 100 people and in most locations, we also offer a second “slave” speaker to provide extra volume where you have a large number of guests and/or where the location has loud background noise. Can I use the equipment after the ceremony? The standard hire period only covers the duration of the ceremony. We will usually pack down the equipment once the photographer gets everyone together for the group photo. Sound equipment hire for the whole day will incur and extra cost and is dependent on availability. 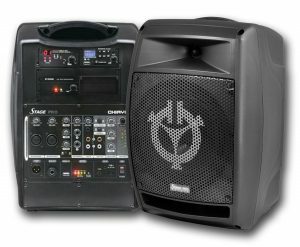 Can we plug other equipment into the sound system? We sometimes get asked if musicians or videographers can plug their instruments or equipment into the sound system for the ceremony. The short answer is yes! There are two additional instrument/microphone plugs available for musical instruments and/or microphones. There is also a line out plug that can be used by videographers to record sound. Can we have our own before/after wedding playlists? Yes of course! We can either use your device to play the music or you can prepare a public Google Music playlist that we will download prior to the ceremony. Can we use our own sound system? You are welcome to use your own sound system if you already have some available through your band or have your own equipment. However, in my experience, issues often arise because either the equipment is not suitable, incorrectly set up or those operating it are not familiar with it. Also, one of the guests usually gets the honour of queuing the music which leaves them in nervous sweats rather than being able to sit back and enjoy the ceremony! I am happy to work with what ever sound system you have, but you may find that hiring a sound system that is tried and tested may be worth the extra pressure and potential issues it will save.